Fungal hyphae making up a network of mycelia. Hyphae really is a fascinating marvel of evolutionary design. In most complex, multicellular organisms, differentiated cells make up unique tissues that carry out specific functions. For example, our livers filter our blood, and are made up of liver cells. In fungi however, hyphal arrangements make up the entirety of the organism, excluding its asexual and sexual spores. These fine tubes radiate throughout the environment, acting as superhighways for soil nutrients, water and plant sugars. They also are the basic building block for the fungal realm, and the main reason for fungal global dominance. Hyphae can arrange itself in multiple ways to carry out a diverse array of ecological functions. Here I will talk about the different hyphal aggregates that are riddled throughout the forest floor. The cell walls of hyphae consist of an inner scaffold of fibers that are structurally enhanced by an outer cross-linked matrix of gel-like or crystalline material. Chitin, a ridged long-chained polymer makes up these scaffold fibers, while the cross-links are mainly branched glucans. Chitin is also the main component of insect exoskeleton, and shows the closer fungal relatedness to animals than to plants. Hyphae growth occurs at its tip rather than elongation of the middle region. A main physiological driver of hyphal tip growth is a vesicle rich structure known as the Spitzenkörper. The Spitzenkörper is the fungal organization center that mediates the processes associated with fungal growth. Hyphae grows in a specific direction depending on the Spitzenkörpers position at the hyphal tip. To this day, we are still largely unsure how the Spitzenkörper moves within the confines of the hyphal tip. Structure of the hyphal tip. Look at the positioning of the Spitzenkörper. Mycelia make up the vast fungal network that lies beneath the forest floor in intact ecosystems. Mycelium is comprised of parallel, largely undifferentiated hyphae. The great mycologist Paul Stamets has uncovered that if you step on myceliated soil, under your hiking shoe, there is approximately 300 miles of mycelia! Though, in a nutrient poor environment when a mature network of mycelium exhausts the nutrients in the substrate it is growing from, the fungus sends out mycelial cords. These are similar to simpler mycelium, except mycelial cords are more tightly aggregated. I’ve encountered my fair share of mycelial cords, hiking in Costa Rica and surveying leaf litter for saprotrophs. In moist habitats with large quantities of leaf litter, peel back some layers of leaves and you will most likely not only find mycelia, but denser, thicker, mycelial cords. If a mycelial cord encounters suitable substrate, the cord will branch out into several individual strands of mycelia, which vastly enhances its surface area. Mycelium spreading over and consuming a fallen leaf in Costa Rica. Thicker, more robust mycelial cords. Both mycelia and mycelial cords are produced by most higher fungi. Evolution doesn’t ‘fix’ what is not ‘broken’, and these hyphal aggregates work fantastic in an exceedingly diverse number of ecosystem types. These simple hyphal formations can radiate throughout the environment, but not to the extent of rhizomorphs. Rhizomorphs are more complex than the other fungal formation mentioned before, and are a main form of dispersal and infection of the honey mushrooms (Armillaria sp.). Honey mushrooms are root parasites that infect a wide array of trees. Once their plant host dies, these fungi finish metabolizing the buried woody roots. Once it has exhausted this resource pool, the fungus sends out these robust, black rhizomorphs that can travel several meters beneath the forest floor in search of another host. The rhizomorph of a Armillaria sp. Rhizomorphs are made up of a central core of elongated cells that are encased in a rind of darkly, melanin pigmented cells. There are two types of rhizomorphs recognized in nature; a cylindrical type, and a flatter, lighter type. Most rhizomorphs are 4mm in diameter, which might seem small, but take into consideration that a rhizomorph that is just 1mm in diameter is made up of 1000 strands of hyphae! Besides Armillaria sp. producing rhizomorphs, tropical Marasmius sp. produce aerial rhizomorphs that intercept fallen plant material so they can exclude other species from utilizing the detritus, enhancing its competitive edge. Rhizomorphs enhance a species ability to access nutrients, but another darkly pigmented hyphal aggregate helps some species survive major disturbance events. The aerial rhizomorphs of a Marasmius sp. Photo by Danny Newman. Sclerotia are hyphal formations that produce dense layers of hyphae which are embedded in a glucan matrix existing outside of the hyphal strands. 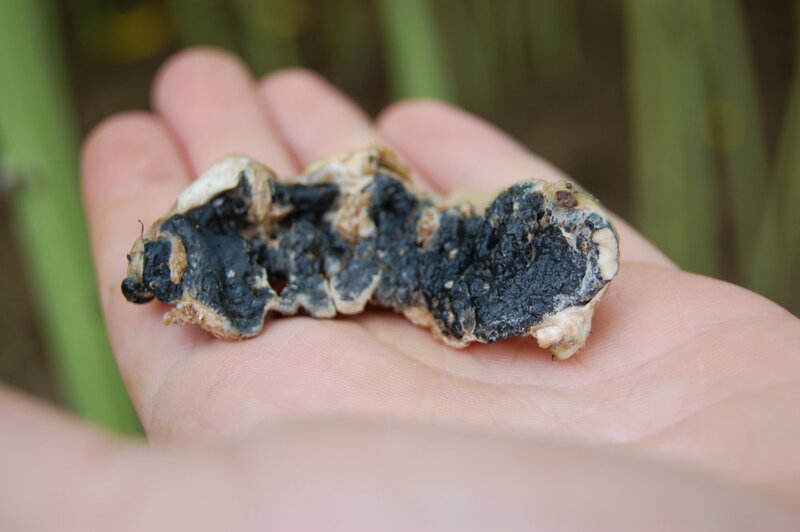 Like rhizomorphs, many sclerotia have an outer, melanin containing protective rind. These structures are analogous to underground fungal bomb shelters, extending fungal survival when adverse conditions are present. In one of my first blog posts, I talk about Morchella tomentosa or the grey morel and how it only fruits from sclerotia after forest fires. Sclerotia contain carbohydrate, protein, lipid, glycogen and polyphosphate reserves so that when favorable conditions return, the fungi can break dormancy and return to an active, ecological functioning lifestyle. Sclerotia greatly vary in size, as one Australian species (Polyporus mylittae) can have football (American) sized sclerotia, while other sclerotia can be made up of just a handful of cells and can only be viewed with a microscope. Another hyphal aggregate that is nearly on the microscopic spectrum are surrounding the fine roots of ectomycorrhizal plants. Ectomycorrhizal fungi (ECM) that form symbiotic relationships with plants engage in the mutualism by sheathing the roots in a cocoon-like structure, called a mantle. The mantle is an incessant sheet of fungal hyphae, several layers thick that encase the fine roots of ECM engaged plants. Strands of hyphae do penetrate these roots, but do not invade the plants cells like in more invasive arbuscular mycorrhizae. Ectomycorrhizae (rounded structures) associated with Douglas-fir roots. The final and most complex hyphal aggregate is the actual fruiting body of higher fungi. Some aspects of this area are still a mystery, and even the stuff we do know cannot be summarized in a single paragraph, and need to be talked about in a future post. Just remember, the parts that make up a fruiting body are made up of a single building block; hyphae. Although fungi don’t produce several different types of cells like us, this kingdom is not morphologically limited. Using hyphae as a building block, these amazing organisms can create quite the array biological structures depending on the growth rate, direction and positioning of hyphal branches. Fungal hyphae are not only a main driver of many ecological processes but represent the entirety of this blog. Yeah, it might just look like a tube up close filled with intracellular contents, but take a step back and realize the endless morphological potential of a single strand of fungal hyphae.